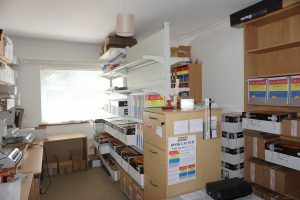 Aaron publications is a family company with roots in Lincolnshire, but now firmly based in Warwickshire in the Midlands. It was formed in 2009 in order to publish ‘All-In-One to Grade 5’ after it had proved successful among Rachel’s own students and in the lunchtime theory classes which she taught in nearby schools. The first copy of ‘All-In-One to Grade 5’ (hardback) was produced in September 2008. The book had already existed a year or more before its publication as hand written loose papers which had been steadily accumulating since 2002. Convenience dictated that the material needed to be in book form so Rachel taught herself how to computer-process the books. The first print run was 125 hardback in total, which sold well following an article placed in the ISM journal (Incorporated society of Musicians) yet was far from ideal due to the fact it was rather large and heavy. However it was a considerable improvement upon Rachel’s box file of loose papers and, being in book form, meant that material was no longer lost by her students. Following the ISM advert, Rhinegold kindly approached Rachel and offered to write a review (Rhinegold is one of the leading resources for music education in the UK). All-In-One to Grade 5 received a very successful write-up in February 2009 at which point, family members clubbed together to finance the production of 2500 paperback copies. The hardback cover was replaced with a thick plastic protective shield which is equally durable, but that created further difficulties because not all printers are equipped with the machinery needed to fit this sort of cover combined with the tough spiral binding we wanted. Also, before the new paperback edition could be published, many hours of editing needed to take place to adjust both margin and content within the book so that the text size would not be affected in the new significantly smaller and lighter edition. Therefore several months of delays ensued before the paperback version could be printed. Meanwhile Aaron publications became officially registered as a business in February 2009. January-March 2012 saw the arrival of the second edition and its corresponding Answer Book. The second edition amalgamates the previously separate Reference Booklet and includes additional exercises for ‘Traditional’ as well as ‘Fractional’ values, to aid the understanding of Time Signatures (as well as other minor adjustments throughout the book). The third most recent edition was published in July 2016 together with two new books called ‘All-In-One: Grades 1-3’ and ‘All-In-One Grades 4-5’ (The new books are based upon the third edition of All-In-One to grade 5 with extra exercises in areas where students need most practice). The third edition features further simplification throughout the book, making it even more accessible to the young beginner and more suitable for students taking the individual grades en route to grade 5 without, most crucially, losing All-In-one’s integrated approach. The number of music theory books Rachel has written is ten in total, which, together form the ‘All-In-One’ series.